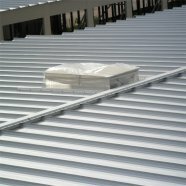 Single, Double Slope And Custom Roof Slopes From 1/4:12 (Standard) To 6:12 Are Constructed Of 24 Gauge *Galvalume Mechanically Seamed Panels That Carry A 20-Year Warranty. Options Include A U.L. 90, 24 Gauge Standing Seam And A 26 Gauge "R" Panel Screw Down Roof. An Array Of Color Options Are Also Availabe. Standard Eave Heights For Single Story Construction Are 8'-6" To 10' With 20' To 22' Eaves Available For Two-Story Designs. 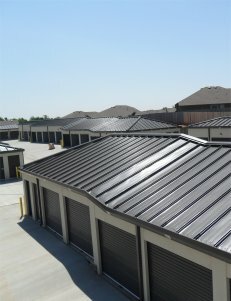 Standing Seam Roof Panels Furnished By Cannon Storage Systems, Inc. Are Classified As A "Hydrostatic" Panel. Metal panel systems that are designed to withstand being submersed in water for a period of time are called hydrostatic panels. Hydrostatic roof details rely on sealant to keep water from infiltrating the joints and seams. Hydrostatic roof details can be used at almost any roof slope (1/4:12 minimum).